When I began my professional football career with the Dallas Cowboys in 1965, there was no single person in charge of lifting weights or running on Coach Tom Landry’s staff. At the time, there were few dedicated strength coaches working in professional football, and the fears of players getting muscle-bound and slow from weight training resulted in most teams shying away from any work with weights. Each player was on his own in maintaining his fitness during the off-season, with the added challenge that most players had to work full-time jobs between seasons to support their families. Other than running drills and general conditioning during practice, there was no formal strength program to follow. At that time, the Cowboys had not achieved the degree of success and fame now chronicled on NFL Films. Despite the guidance of Coach Landry and an immensely talented roster, we were unfortunately known as “Next Year’s Champions.” Our success only extended so far as the playoffs, where we would ultimately fail to achieve our championship goals. In 1970, I became a player-coach and technically became the franchise’s first unofficial strength and conditioning coach. On the recommendation of Coach Landry, I travelled to speak with Alvin Roy, who in 1963 had become the first NFL strength and conditioning coach with the San Diego Chargers. He graciously educated me on his methods of training for football, including lifting weights and running, which I took back to Dallas. Coach Landry believed so strongly in the importance of the program I designed that we became one of the first teams to pay players to entice them to train together in Dallas during the off-season. That change not only dramatically improved the overall strength and resilience of the players, but it also created an environment of healthy competition within the team. Seeing someone else fighting and not missing a workout sent the message that if you were ever going to overcome and become a starter, you were going to have to put in the same level of work. By the end of that first summer of training, the improved physical performance and cohesion of the team propelled us to the franchise’s first Super Bowl, which we lost on a last-second field goal. Despite another missed opportunity, the confidence we gained from that first year of the program, combined with fewer injuries and buy-in from coaches and players, was no doubt a huge contributor to the change in the franchise’s fortunes as well as the careers of many of our players over the next decade. When I later became head coach of the Denver Broncos, I knew my success as a coach would be tied to maximizing the physical abilities of our athletes, and that began with instituting a comprehensive strength and conditioning program. On the recommendation of Alvin Roy, I hired Bear Bryant’s strength coach at the University of Alabama, Al Miller. Not only was Al well-regarded in the field, he was a true student of the science of training for performance enhancement. He was always innovative in his approach to training and would actively seek out other successful coaches to learn and adapt his methods. He literally travelled the world to study from the best, whether they were coaching in Russian or at the Olympic training center or even within the NFL—particularly his collaboration and friendship with fellow strength coach Johnny Parker. There’s no question that my success and that of my teams were directly tied to the impact of Al’s constant search for the best tools and methods of performance training. Today you will not find a single NFL team that does not employ an entire team of strength and conditioning professionals. You would be hard pressed to find any sports team at the professional, college, or high school level that doesn’t have at least one strength coach. 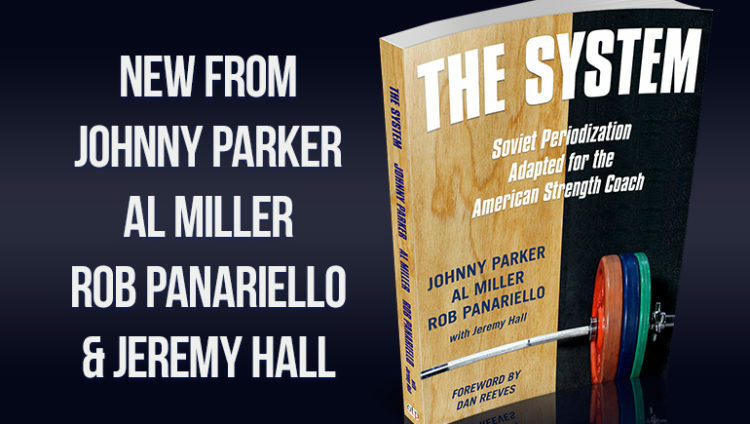 This book contains the distilled knowledge and wisdom of Al Miller and Johnny Parker, who are possibly two of the most successful strength coaches in NFL history. You would need to combine the careers of about 10 people to achieve the same level of success and impact on the field and the profession as Al and Johnny. Over more than 40 years, Al and Johnny created a system from the best training methods and strategies that consistently produced multiple championship teams. I have no doubt that in this book, you will find invaluable information to elevate the performance of your athletes. But, if there is one thing I hope you can take away, it is in recognizing there are different ways to accomplish the same goals. Principles will always remain the same, but adapting your approach to the athletes and using what the authors call the “eye of the coach” is what will have the biggest impact on your athletes’ performance. Other than getting great players, success is ultimately about making those players better. I believe that placing the athlete first and adopting an open and flexible approach to coaching are the greatest strengths of these coaches and is the true secret to their success. I can attest to the positive impact their system of training and their shared passion had on my coaching career, and I hope that you will learn and benefit from their knowledge as much as I did.